Mini Makers Day exposes children, teens and adults to the history of tradesmen and the makers of the past. Guests can watch live demonstrations, participate in hands-on activities and converse with expert makers. Mini Makers Day is Sun., July 24 from 1 to 4pm at Naper Settlement, 523 S. Webster St., Naperville. Admission is $12/adult, $10/senior (62+), $8/youth, Naperville residents with an ID and members are free. Admission includes free sundaes from Colonial Cafe with do-it-yourself toppings. Ice cream is served from 2 to 3:30pm and is limited to the first 200 children. The Maker Movement encourages people to build, create, design and make. Whether it’s in science, technology, art or clothing; the Maker Movement inspires the concept of making. This includes everything from the high-tech start-up companies in Silicon Valley to small businesses featuring handmade goods on websites like Etsy. With Mini Makers Day, Naper Settlement is celebrating the Maker Movement from its beginnings. Explore the roots of the Maker Movement with a practicing blacksmith. 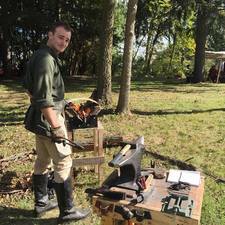 “Visitors will see the continuation of 19th century blacksmith techniques into the modern world,” said blacksmith Justin Stech. At Naper Settlement’s Blacksmith Shop, visitors are able to witness this trade in action in the environment that the original tradesman would have worked. “The importance of basic physics, namely heat and pressure, will be discussed as well as the basis of how my work is actually capable of being completed,” said Stech. Visitors will be able to examine and observe original blacksmithing techniques. Stech will provide demonstrations on how to produce small home goods and personal items, such as jewelry. Mini Makers Day will not only display the Maker Movement of the past, but the future as well. The Naperville Library will be bringing examples of new technology to Naper Settlement for the event. “Visitors will be able to see our mini 3D printer and 3D pens,” said computer lab Supervisor Sue Karas. Throughout the event, the library will demonstrate how the pens and printer works and discuss details about both objects including cost, functions and how long it takes to print. “The library will provide information on how one can use the 3D printer at the library and what it is typically used for,” said Karas. 3D printing has been a major part of the Maker Movement in the recent years. It is used for everything from apparel, to car parts and even organs with living tissue. The future of 3D printing is wide open and something that is worth taking a look at during Mini Makers Day. In addition to the blacksmith and 3D printing, Mini Makers Day will also display many other activities and demonstrations for guests. Dr. B with the Belfry Bees, Esther's Place Fibers, Blackhawk Woodworkers, a quilter, a basket weaver and a metalworker will all be in attendance. The Maker Movement encompasses a vast amount of trades and skills and Naper Settlement is excited to share a few of these with the community.